PUEBLO – The Colorado State University-Pueblo Office of External Affairs earned a Gold Award from the Council for the Advancement and Support of Education (CASE) District VI for its Points of Pride Signage Program, which highlight campus milestones and accomplishments at six locations across campus. CSU-Pueblo Executive Director of External Affairs Cora Zaletel will accept the award at the CASE VI joint conference held Jan. 28-30 in St. Louis, Mo. The award was one of 162 winners in 62 categories chosen from 327 total entries submitted by CASE VI member institutions. The award was one of only two in the Strategic Communication category and the only award in the Public Relations and Community Relations category. The Council for Advancement and Support of Education (CASE) supports alumni relations, communications, development, and marketing professionals at educational institutions worldwide. The association provides networking, recognition, and continuing education for more than 64,000 advancement professionals at more than 3,400 colleges, universities, and independent elementary and secondary schools in more than 70 countries. CASE District VI represents professionals and institutions in the Midwest region of the United States (Colorado, Iowa, Kansas, Missouri, Nebraska, North Dakota, South Dakota, and Wyoming). 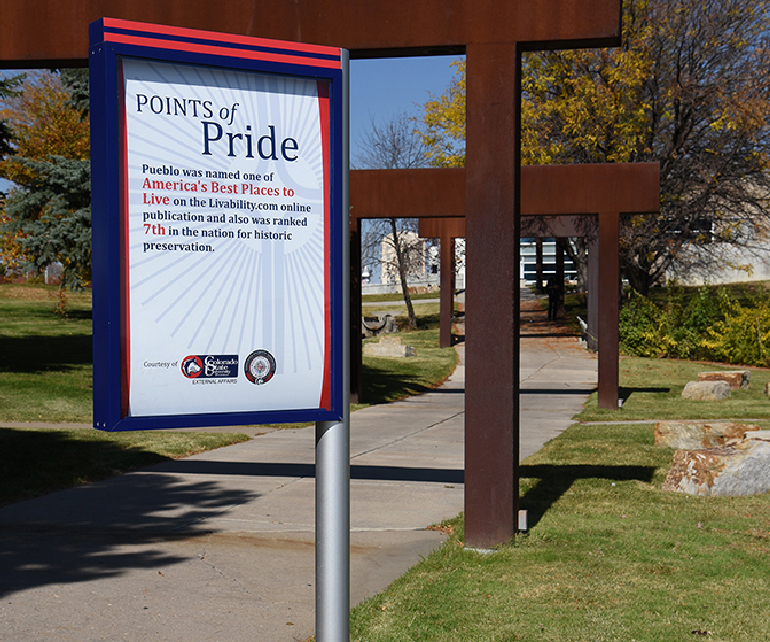 The idea for the Points of Pride Signage Program began in 2016 as a partnership between the CSU-Pueblo External Affairs Office and Associated Students’ Government (ASG). ASG approached the External Affairs Office with the idea of funding the placement of signs across campus that would highlight points of pride to faculty, staff, current and prospective students as well as campus visitors, while increasing the visibility of their organization. Representatives from each organization met to determine the look and proper locations of the signs based on the available funding ($20,000) and the amount of traffic at each location. In order to best utilize resources, the team determined that each of six signs would include two different messages back to back that would be rotated quarterly throughout the campus to provide optimum exposure. The signs will be updated annually to reflect any changes to the facts and/or accomplishments. “Given that the University welcomes more than 250,000 visitors to campus annually to athletic contests, high school competitions, discover days, as well as foundation and alumni events, we believe the initiative will inform as well as inspire with hopes of attracting additional students and financial support to the institution,” said Executive Director of External Affairs Cora Zaletel. After a nearly a year of planning, the Points of Pride facts were installed in September of 2017. Student Ambassadors have adjusted their campus visit routes and scripts to incorporate the signs as part of their tours. ASG plans to conduct student surveys to evaluate the return on their investment in terms of increasing their organization's visibility and increasing student knowledge of the University's unique accomplishments.